Robin specializes in helping clients solve the daily headaches of running a business, such as managing payroll and QuickBooks processes. She provides controller services and tax preparation services, as well as reviews and compilations, for companies in a range of industries. With over 25 years’ experience, Robin brings valuable knowledge as a member of our construction group. 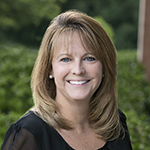 A George Mason University grad, Robin is a mother of two who loves going to the beach and river to jet ski, water ski, tube, and relax with her family.